The tune for this short-and-silly song borrows from one sung by a close relative of the otter, this one indigenous to the Hundred Acre Wood. Apologies to the peerless Sherman brothers. is otters are wonderful things! to cling to rocks and rings! There’s always more than one! is rivers are sometimes their home! and that’s why they don’t dine alone! is some of them live in the sea! they’re making a great big comeback! and hunting is way out-of-whack! Click to enlarge! 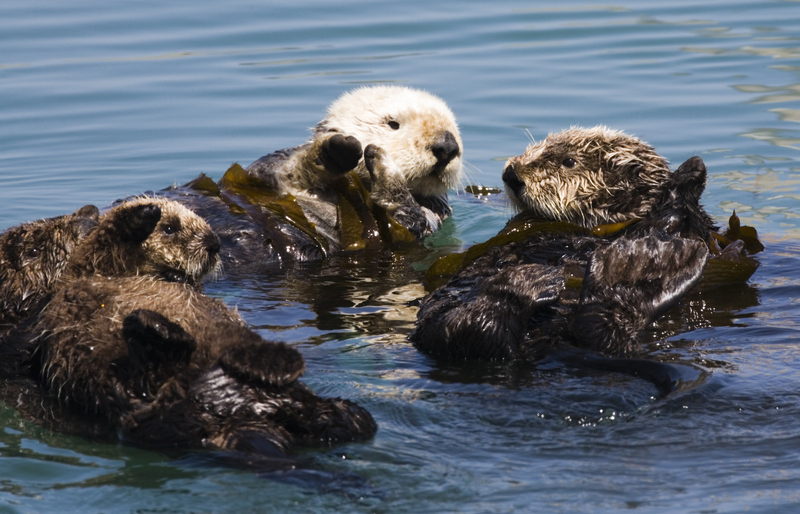 A group of sea otters is called a raft. This raft is a family of four—Mom and two pups on the left, and an adolescent or adult sea otter on the right. Notice the way the adults have anchored themselves to this spot in the ocean by wrapping long strands of kelp (seaweed) around their bodies. Also, the cuteness. Photo by Mike Baird. This file is licensed under the Creative Commons Attribution 2.0 Generic license. This post was originally written in anticipation of the 2014 BioBlitz at Golden Gate National Recreation Area. Bioblitzers got a chance to see both the North American river otter and the California sea otter. Loving this post! I am lovers of otters and Enjoying to read about otters.Otters are fun creatures to watch and they are highly intelligent. It was fun to know more about these beautiful and fun loving creatures. It is a most wonderful thing about otters that there is more than just one! Thank you for the fun way to celebrate otters. I love to visit the two North American River Otters at the National Zoo — brothers Konrad and Niko. They are fun to watch! But the Zoo Keepers say they don’t play with the otters. The otters have sharp teeth and claws and get very aggressive over food. Now I will be singing your song when I visit them!